My locksmith service is based in Cardiff and i also live in Cardiff. As i live in Cardiff i can be at most places in a short span of time within the Cardiff region. As most of my business is mostly for the Cardiff customers this allows me to do my job at helping people with there locks, within a short length of time which reassures yourself that i won't be long to get to your address and get you back in to the warm and dry. When you phone us for a quote we will let you know how long we will be before we get to your address, On occasions we can be quite busy but we will let you know how long we will roughly be before we will be leaving and how long it will take to get to your destination. If your job is an emergency we will do our very to make you priority, if there is jobs ahead of yourselves which are not emergencies we will do our very best re-schedule them and priorities yourself. 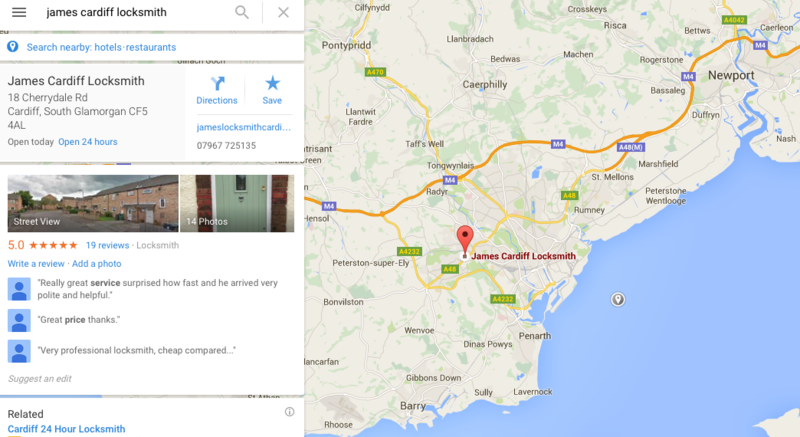 James Cardiff Locksmith not only delivers services within Cardiff but surrounding locations. We thrive on helping customers as helping you is our main aim. We help customers through out the surrounding areas of Cardiff such as Penarth, Barry, Cowbridge and many other close areas of Cardiff. Locksmith Are often thought of as someone who can break in to anything and leave no trace of ever opening the lock. Here at your locksmith Cardiff we undermine a locksmith as some one who can gain entry to locks with leaving no damage or as little damage as possible. Whether it be deadlocks, safe locks car or automobile. James your local Locksmith Cardiff don't just deal with one specific type of locking system but a range to give you peace of mind. For instance if you have been burgled and your keys are stolen not only can we change the locks on your home but your business, Car, Van and even Automobile. James is not only a Commercial and Domestic Locksmith but a Auto Locksmith too.